Travel Reward Credit Cards and loyalty reward programs are some of the best ways to start gaining access to the glorious world of free traveling. And trust me, there's no better rush than getting expensive flights, access to exclusive airport lounges, and luxurious hotel rooms for free. Two one-way flights from San Francisco to Washington D.C. Here's my step-by-step guide on how I got started traveling for free. Many credit card companies offer generous sign-up bonuses when you open up a new credit card. One of the best examples is the Chase Sapphire Reserve Credit Card (referral link), which recently allowed customers to earn 100,000 points if they spent $4,000 in the first three months of the account opening. That's the equivalent of $1500 in free airfare/hotels! On average, most credit cards offer a sign-up bonus around 50,000 points, which can value around $600 to $750, depending on how you spend it. Over the past year, I've earned a quarter of a million points using this method. It can be a great way to dive into the world of free travel. Unfortunately, I must add that this is not reliable for everyone. You must be able to pay your credit cards on time and usually need to have a strong credit score to qualify. You also have to be able to spend a certain amount of money within a specific time period to obtain the bonus reward. I strongly suggest checking your credit score, making sure you can pay your bills on time, and budgeting out your monthly expenses before trying this out. ​If this method does seem right for you - the next step is about choosing the right credit card. There are several different factors that you need to first consider including whether or not it comes with an annual fee, the reward system, and more. In my opinion, the best starter travel credit cards are the Chase Sapphire Preferred Card (referral link) and the Barclaycard Arrival Plus World Elite MasterCard. 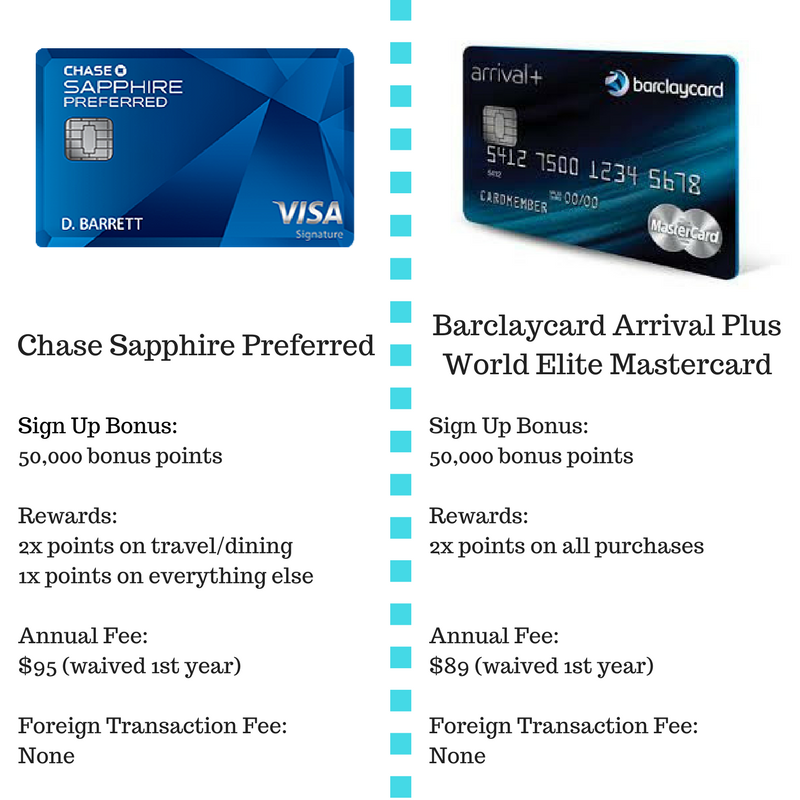 Both of these cards have great travel benefits and they have no annual fee the first year -- below are more details. ​NOTE: These specific credit card offers may no longer be valid. Try to never pay with cash and use your new credit card to pay for all of your normal expenses. When paying for items (groceries, restaurant bill, gas etc. ), it's essential that you pay using the credit card that will give you the highest amount of points for each purchase. For example, if I am buying some new clothes, I would use my Barclaycard Arrival Plus World Elite Mastercard because it gives me 2x points on all purchases. If I used my Chase Sapphire Preferred Card for this same purchase (the card which only gives 2x points on travel/dining), I would have only received 1x points and not maximized my purchase. I cringe whenever I see someone paying for something with the "wrong" credit card - it's like rejecting free money! Most major airlines, hotels, and rental car companies have loyalty reward programs. It's free to sign up, allows you to collect more points and miles, and there are other perks involved (particularly as you gain higher-tier elite status). 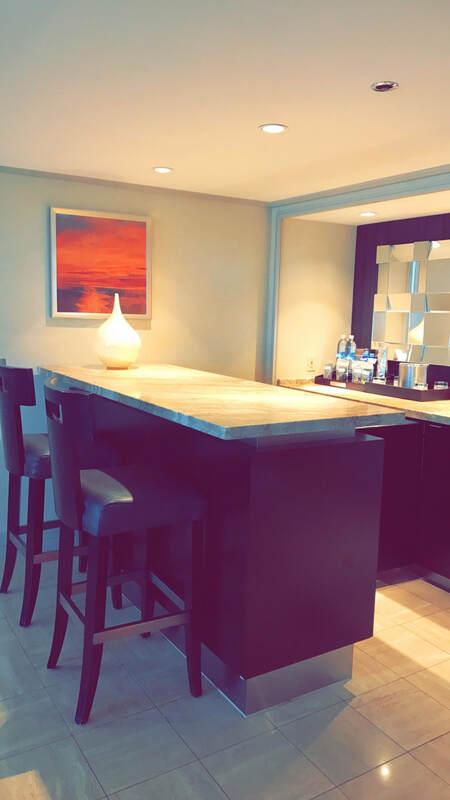 For example, if you're going to stay at a Hilton hotel, make sure you sign up for HHonors Program so you don't let those points slip away! If you fly there using United, sign up for United MileagePlus so you don't miss out on those frequent flier miles. They begin to add up over time so there's no reason not to do it. It can get a bit difficult tracking all of your loyalty program accounts, so I recommend using an online mileage manager. Essentially, these free websites help you keep track of your points and miles across several programs. They also will help notify you if your points or miles are about to expire. Some examples include AwardWallet and Points.com. This is another great way to earn extra points or miles -- simply by eating at a participating restaurant. Many airlines and hotel chains offer a dining rewards program (AAdvantage Dining, Hilton Honors Dining, United MileagePlus Dining, etc). Just create a free account, link it to one of your credit cards, search for participating restaurants in your area, and go out to eat! ​Whenever you eat or drink at a participating restaurant in the dining program's network, you earn points through both your credit card and the dining rewards program -- double win! Some of these programs, such as AAdvantage Dining, offer 5 miles for every $1 spent. This program also allows you to earn up to 3,000 bonus miles in your first 30 days. ​I recommend choosing the dining rewards program for the hotel or airline that you most frequently use as each reward program is pretty comparable. You can't link the same credit card across multiple dining programs. If you love to shop online, make sure you first go to an airline or hotel's shopping portal, such as United MileagePlus Shopping. You will likely find your favorite retailers listed on their site. From there, click on your favorite store and you will get taken directly to the retailer's main website. The difference? You earn bonus miles or points for your purchase in addition to the points that you earn through your credit card. Just one example -- right now you can earn 2 miles for every $1 spent at Macy's if you go to the retailer's website through the United MileagePlus Shopping portal. Ready for a free adventure? Following these travel tips should help you start earning enough miles and points to redeem them for free plane tickets and hotel stays for destinations around the world. Just remember to stay organized, always pay your credit cards on time, and focus on your travel goals. Whether it's an epic family trip to the Grand Canyon or flying first class to Europe for free - you can do it! © 2017 NAVIGATE ABROAD. ALL RIGHTS RESERVED.